Just One Day by Gayle Forman. Dutton Books, 2013. Currently available. Face Value: HALLELUJAH. This is a YA book that looks like a normal, appealing, grown-up book. There are no condescending neon goofy fonts or headless females. This is a contemporary looking, mysterious and beautiful photograph of a real girl. The details are perfect – she has the watch, the short bob, and the blurred European background. What I love most about this picture is that it captures the mood of the story. That blurry photo reflects the uncertainty and fluidity of the journey that Allyson takes. Does it break the slate? Yes, and in unexpected ways. It’s amazing to me how a story about a girl going after a guy she had a one-night-stand with can be such a Slatebreaking story. Although Forman wrote a story about a girl pursuing a mysterious and magnetic lover, the story is really more about Allyson than it is about Willem. That’s why we get a book two told from Willem’s perspective. I CAN’T WAIT. Who would we give it to? Right now I love this book so much that I want to airdrop cartons of this book into communities of girls all over the globe. But I suppose I can narrow down my ideas: Hand this to the girl who is about to study abroad. Give it to the girl with a helicopter parent. Distribute copies en masse at freshman college orientation. Review: Did y’all read If I Stay? Because I did, and it rocked my world. Sarah gave it to me back when I was just dipping my toes into the world of YA and I adored it. Gayle Forman has a talent for writing gut-wrenching realistic fiction. 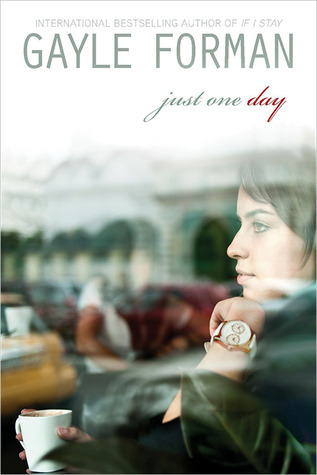 Just One Day is the first of a new book duo by Foreman. In Just One Day, we read about Allyson and her adventurous, romantic, and completely spontaneous day in Paris with the alluring Dutch actor Willem. The follow up will be Just One Year, telling the story from Willem’s perspective. There is so much to love about Just One Day, so I’ll start with the obvious: the premise. Is there anything more wonderful than a jaunt around Europe? That may sound great to most people, but for Allyson it’s kind of a drag. She is a quiet, studious young woman who has spent her whole life doing exactly what is expected of her and sticking within prescribed boundaries. When her parents send her to Europe on a post-graduation tour, it’s with a program that structures every minute of every day and crams as many “cultural experiences” into the trip as possible. Although the trip has been nice, Allyson feels exhausted with it all and is ready to go home…until a chance encounter with Shakespeare whirls her around and sends her on an adventure. Allyson decides to ditch a Royal Shakespeare Company production of Hamlet to see instead an open-air guerilla production of Twelfth Night on one of the last days of her European trip. The production is unlike anything she has ever seen before. The way the actors embody the characters and interpret the language allows Shakespeare to come alive and feel exciting for her again. She has a ‘moment’ with one of the actors, Willem – and runs into him again the next day on a train. When he invites her to take a spontaneous trip to Paris (leaving just enough time for her to experience the city and still catch her flight home), she hesitates. Allyson is a good girl, and good girls don’t randomly go to Paris with strangers. But then she makes a rash decision. She’s been a good girl all of her life, and she has never had the chance to feel independent or spontaneous. Allyson and Willem embark on what is, naturally, a splendid and adventurous day in the most romantic city in the world. When Allyson wakes up the next morning, Willem is gone. He left her high and dry after a one-night stand. Reeling and alone in a strange city, Allyson manages to find her way back to London for her trip home. After many tears are shed, she’s ready to move on…or so she thinks. Forman takes one memorable day and spins it into a rollercoaster of a journey for Allyson. The rest of the book takes us through the year following her day in Paris, and her journey from self-loathing to self-acceptance. She struggles to recover after her day in Paris, and she thinks it is because she fell in love with a stranger who left her behind. But that’s not the real story. Allyson struggles with her post-high school transition because she has always had a mother who arranges everything for her, and has always thought that she knew exactly what steps to take to reach her goals. But what happens when goals change? What do you do when you change and no longer want the things that you thought you wanted? As I said before, it was surprising to me that a book about yearning for a lost love could be so feminist, but it absolutely is. Allyson works through the “post break-up” feelings to get to the root of the cause: her dissatisfaction with herself. She faces some formidable opposition as she tries to rearrange her life into something better. Her mother challenges her at every turn and her best friends morphs into someone unrecognizable as she goes through her own post-high-school transition. Despite her challenges and her complete lack of preparation for facing the world on her own, she manages to accomplish her goals. It is incredible satisfying to see Allyson meet the objectives she has set for herself without help from friends, parents, or a significant other. She has to work through it all on her own before she is ready to dive back in to the possibility of love. Of course, because this book is the first of a pair, there are more adventures and a cliffhanger ending. I’m not going to say any more about that because it will leave you crying and hollering and shaking your fists at the sky. I will tell you this: there is more Shakespeare involved, and it is woven into the story with impeccable skill. That Gayle Forman sure knows how to write a book. I can’t believe I will have to wait to read the next one – but given how long Allyson has to wait to find the answers to her questions, it seems small in comparison. This entry was posted in Reviews, Young Adult and tagged Europe, Gayle Forman, Paris, Realistic Fiction, Romance, spontaneity, travel, ya. Bookmark the permalink.